Does biking make you thirsty? Eau Claire entrepreneur Alex Bauchle wants customers to be able to whet their whistles while pumping pedals on downtown streets. 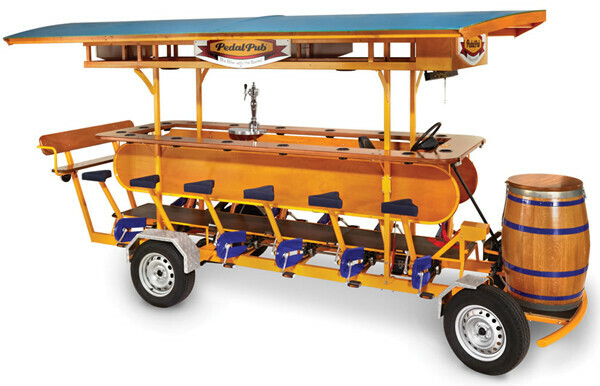 Bauchle is in the process of purchasing a pedal pub, which he hopes to have operating in Eau Claire by June. While such people-powered quadracycles have popped up in cities nationwide – including in Madison and Milwaukee – the Eau Claire Cycle Pub will be the first of its kind in the Chippewa Valley. “It’s been something I’ve been wanting to do for the past three years,” explained Bauchle, who also owns and operates Priority Valet, the valet service at the Lismore Hotel and the Pablo Center. “It’s a very unique experience,” he said, describing pedal pub outings he’s had elsewhere. “The two hours fly by. … A lot of your experience is determined on your tour guide, the pilot, and how they’re able to engage with the passengers.” The Eau Claire Cycle Pub – which is being custom-made for Bauchle by a company in Oregon – will accommodate up to 14 passengers (eight of whom have to pedal) with a pilot to steer and brake. The cycle pub won’t provide alcohol, but passengers will be able to bring their own drinks onboard as long as they keep them there (otherwise, they’d be risking open-container violations). According to the City of Eau Claire, the pedal pub will require no special licensing, but its passengers must abide by state statutes and city ordinances pertaining to alcohol. Bauchle said he’s in the process of finalizing the cycle pub’s routes and hope to partner with taverns that would serve as stops. If alcohol is present on cycle pub outings, all riders will have to be 21 or older, but some alcohol-free trips may be offered for the 18-and-up crowd. While the wheels won’t hit the pavement until summer, Bauchle hopes to launch an online presence for the cycle pub by mid-April.